It was a great season for peonies in my neck of the woods—Ocean County, New Jersey. Backloaded winters aside, it seems extended cool, wet conditions are a peony’s friend. Check out the peony floral arrangements Eastlin Floral Design was busy putting together. This flower species is a serious boon to any bouquet. As for my yard, it boasted a few primetime peony blossoms in 2018. They made an excellent subject for my 100mm macro lens. Lighting conditions proved ideal for creating a dreamy, high key picture set in a cool tone. Had the late afternoon sun been direct, a yellow tone with strong shadows and highlights would have cast a far different look. 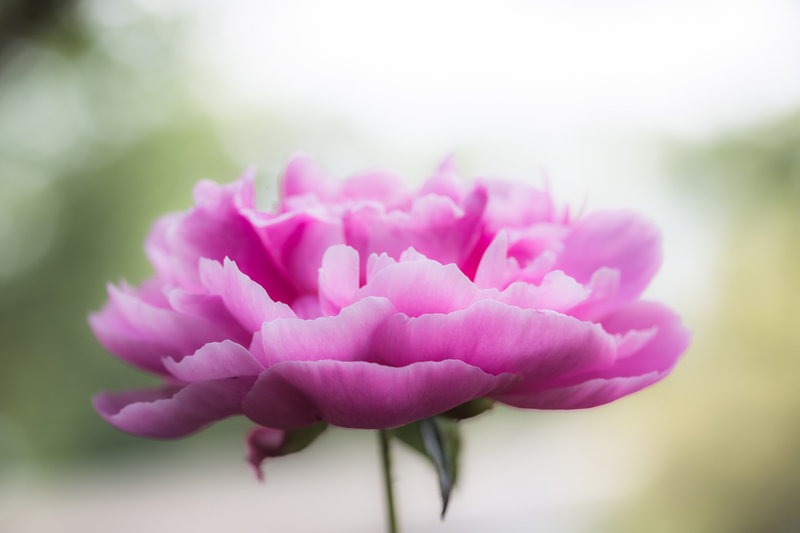 A high overcast was pivotal here, keeping a standout rose pink color tone on the peony petals. To further maximize the high key effect from ample filtered ambient light I was at an open(ish) f/4 aperture at 100mm. Coupled with a close subject proximity this renders an airy focus and bokeh for days. The end result is a center weight flower macro evoking a calm, easygoing mood.